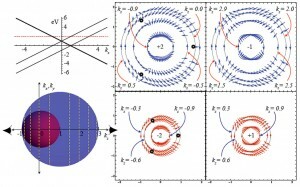 Top left: Band dispersion in the k·p theory of strained HgTe as a function of momentum along the (111) axis, featuring an unusual band crossing. The Fermi surface (bottom left) consists of two spherical shells that touch on the z axis. 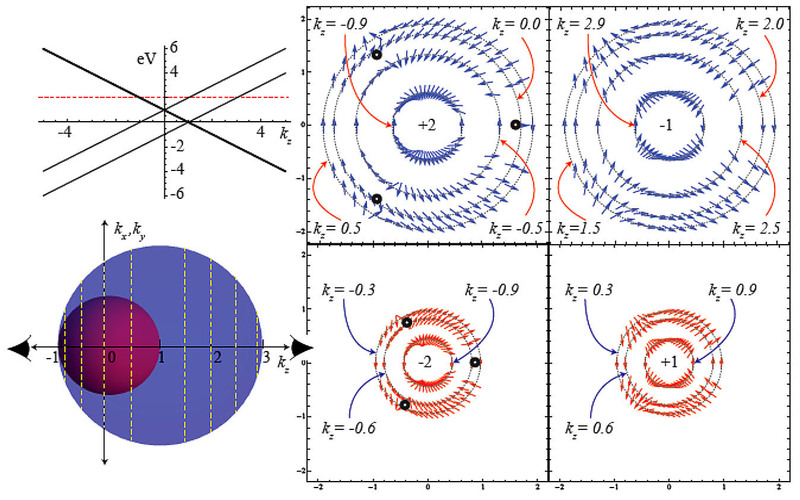 The right panels show the spin texture and spin winding numbers of the valence band states on the red (blue) Fermi surfaces. There are three points indicated where the spin texture vanishes. In the past few years, the theory of topological band structures has been generalized beyond topological insulators to include topological semimetals, including Weyl semimetals, Dirac semimetals and other “symmetry protected” topological states. HgTe is a semimetal in which the degeneracy of the conduction and valence band at the G point is protected by symmetry. In their early work on topological insulators, Fu and Kane showed that straining HgTe opens a gap at G, resulting in a topological insulator. Here we showed that the situation in HgTe is a bit more complicated – and interesting. For tensile strain, while the degeneracy at G is lifted, away from G bands must cross the Fermi energy, resulting in an unusual kind of Fermi surface that is protected by mirror symmetry and features doubly degenerate bands that cross two singly degenerate bands. The band crossing is neither a Weyl point (a singly degenerate crossing) nor a Dirac point (a doubly degenerate crossing), but rather a hybrid between the two. This leads to a nontrivial texture for the electronic spin on the Fermi surface. We combined first principles calculation with a systematic k·p analysis to map out these properties in detail.